SCHENK was founded in Switzerland in 1893. The vision of Arnold Schenk, son of founder Charles Schenk, was to create a wine group with a European dimension. Over a century after its creation, SCHENK now has holdings in Switzerland, France, Italy, Spain, Germany, Benelux and in the UK. This pan-European structure makes SCHENK a unique body in terms of international wine production. The scope of its activities covers every single aspect of the wine trade, from vineyard management to direct sales. SCHENK has maintained its commitment to producing quality wine by continuously investing in sustainable vineyards and state of the art technology for winemaking, bottling and storage. During the 2019 ProWein, François Schenk was awarded the “International Wine Entrepreneur of the year award”. 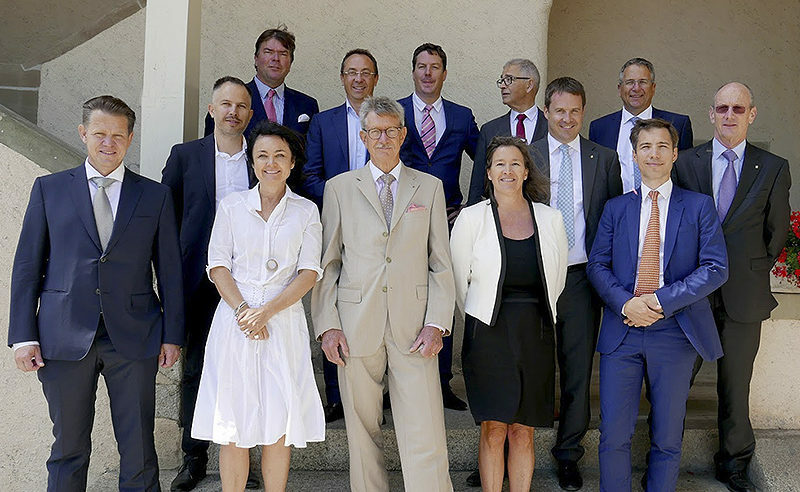 From left to right: Jonathan Pennella – CFO, Olivier de Simone – Family & Board member, Alexandra Post Quillet – Board member, Frank Hooij – Head of International activities, Bernard Lukey – Board member, Wolfgang Martz – Chairman, François Schenk – Family & Board member, Corine Raoux-Fontanet – Board member, Armin Henzen – Board member, Philippe Schenk – Family & Management member, André Fuchs – Head of Swiss activities, Jacques de Simone – Family & Management member, Jean-Claude Vaucher – CEO.